The Omar Ali Saifuddien Mosque is dominates the city centre of Bandar Seri Begawan. It is one of the most magnificent mosques of South East Asia, and a symbol of the strong Islamic faith of the People of Brunei. The mosque was completed in 1958 and is named after the 28th Sultan, Omar Ali Saifuddien, who is still referred to as the architect of modern Brunei. First established in 1965. The Brunei Museum occupied its present site since in 1970 and officially opened in 1972 by Queen Elizabeth II. Located at Kota Batu 5 km from the capital and widely known as one of the region's most beautiful structures. The museum stores a priceless collection of the royal regalia that has been inherited from generation to generation. It was built to commemorate the 1992 Silver Jubilee of His Majesty the Sultan and Yang Di Pertuan of Brunei Darussalam's ascension. The building, with its distinctively gilded dome, has become an outstanding landmark in the heart of the captial. 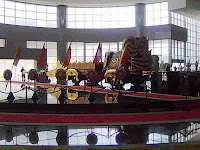 It houses gold and silver armoury, a royal chariot , a replica of the throne and gifts that His Majesty has received. Ulu Temburong National Park occupies approx 50,000 ha of the Batu Apoi Forest Reserve. The Park's locality and steep, swampy terrain have limited human impact on the area and helped preserve its rich biodiversity. A tourists from Brazilian doing a day trip to our National Park. An opportunity to tour the city and river cruise during night time. Visit to Night Food Market then stop by for photos at the iconic S.O.A.S Mosque and Jame' Asr' Mosque where you will capture the beauty of the two mosques during night time. These Proboscis Monkeys are only found in Borneo Island and Sumatra. These bizarre long nose monkeys normally gather in groups by the riverside looking for food. Istana Nurul Iman, His Majesty's residence, is the largest residential palace in the world, with 1,700 rooms highlighted by its golden domes and sweeping rooflines. International and local visitors are welcomed to join and greet members of the royal family during Hari Raya Aidil Fitri festives, when the palace is open to the public. HARRAZ Leisure & Nature Tours owned and managed by 100% local Bruneian, who cares about quality of services, travels and committed our lives to it. We are stands by our promises, best rates and value of services. From the moment you interact with HARRAZ LEISURE & NATURE TOURS, you will find the travel human services with whole-heartedly. Our Company is responsible for introducing a rich and Majestic Royal Heritage, the Traditions and Culture of the Malay and Borneo peoples, Best Golfing Facilities, Safe, Peaceful, Healthy and Friendly destination. 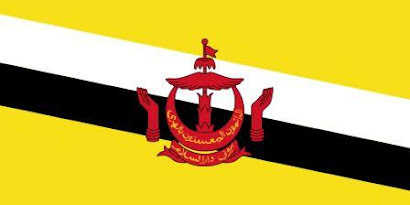 Brunei is a small Islamic Sultanate nestled on the North West Coast of Borneo. It is divided into four districts and an important source of Oil and Liquefied Natural Gas for the expanding markets of Asia and the Far East. Brunei is a home to the World's only Sovereign Malay Sultanate, custodian of a vibrant culture linked to its centuries Old Royal and Islamic Heritage and Traditions covered almost entirely by pristine and easy accessible tropical rainforests teeming with a rich diversity of flora and fauna, blessed by abundant reserves of natural resources that have resulted in one of Asia's highest standards of living shielded by nature from the extremes weather or seismic activity. Brunei Darussalam is not a lucky country of its inhabitants, but one that visitors can enjoy with peace of mind and in tranquillity. Population - 391,000. Malay Majority with significant Chinese, Borneo Indigenous and expatriate minorities. Malay is the official language, English widely spoken as well as Mandarin Chinese and Borneo dialects. Government - Constitutional Monarchy, His Majesty Sultan Haji Hassanal Bolkiah the 29th Sultan of Brunei is head of state and head of Government. Religion - Islam is the official religion and freedom of worship for other religions. Established in 1988 and officially opened in 1994 by His Majesty the Sultan in conjunction with His 48th birthday. The biggest mosque in Brunei and it is an endowement from His Majesty. This mosque has 29 golden domes and marble steps which symbolise the 29th Sultanate of Brunei. 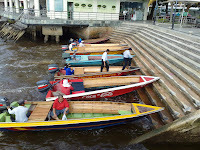 Passenger Speedboats or Flying Coffin as described by some European which will take passengers going to Temburong district. This is the place where we declared our independence on 1st January 1984 from British protection and also celebrating our Beloved King Birthday Every 15 July. The Tamu or open air Market where traders set up stalls to sell almost anything from fruits and vegetables, fish, flowers & plants, handicrafts, homemade local cakes & kueh mueh, food, traditional herbs and etc. this morning market operating as early as 5am untill 6pm everyday. A canopy walkway affords visitors an opportunity to observe the rainforest's surprisingly diverse treetop ecosystems. 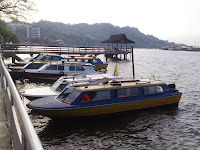 Visitors can access Kampong Ayer by riding on water taxis or perahu tambang which transport you to and from the shore.